Now that you’ve had the best day of your life (not to mention the honeymoon), how do you keep that happiness high going? 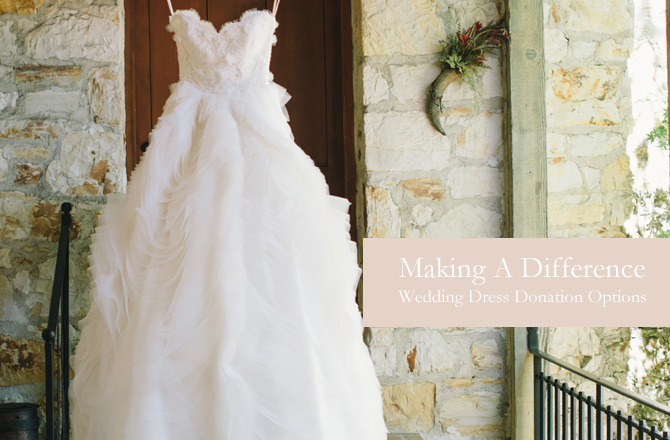 One way is to pay it forward is by donating your wedding gown. Gone are the days of saving your gown for your daughter, most women want a gown of their own to match the trends of the day and their own personal style. And if re-sale isn’t for you, why not help another woman out by donating your dream dress to one of these worthy organizations, and earn that first newlywed tax write-off too! Please visit these organizations websites for specific details on their individual donating procedures and tax deduction information. You can make a donation to any organization across the country by following each one’s donation guidelines. Brides Across America is a national organization that provides free wedding gowns to brides who serve in the U.S. military or are marrying a service member. In addition to providing free gowns, they also resell used wedding gowns and wedding gown samples from designers and bridal salons directly from their website to help raise funds to assist military families and veterans. Brides For A Cause resells weddings dresses in two locations in Washington, at traveling “roadshows” across the country, and through an online boutique. Like its retail operation, this nonprofit organization partners with various charity groups. One of its main benefactors is Wish Upon A Wedding, a national non-profit organization with local chapters run by some of the top talents in the wedding industry to grant wedding wishes to couples with medical illnesses or life-altering circumstances. 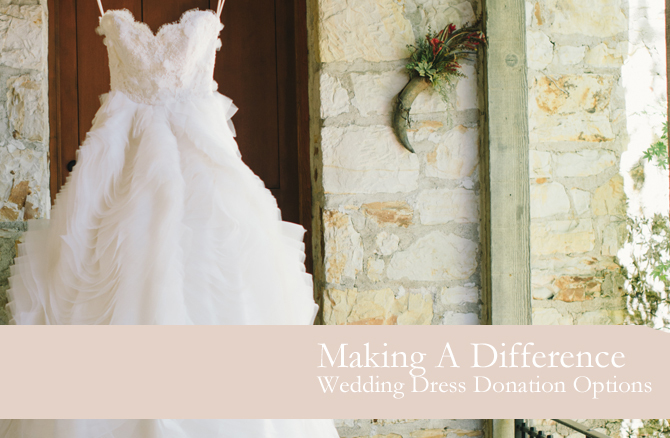 Brides For a Cause is one of the few organizations that holds “Dress Drives” across the country to make it super easy to donate. Fairytale Brides on a Shoestring is a nonprofit bridal salon located outside Washington, D.C. that accepts donations from anywhere in the country. The salon’s motto is “empowering women one dress at a time.” To do this, they sell used wedding gowns and bridal accessories at a fraction of the original retail cost and donates all of the proceeds to women’s charities, such as Suited for Change and Victims Rights Foundation, as well as providing college scholarships to local high school seniors. The salon’s staff is made up of volunteers and they often participate in local charity events throughout the community. They are truly Fairy-Godmothers! The Brides Project is another locally-based bridal salon that focuses on the resale of used bridal gowns and unworn samples and accessories to raise money for the Cancer Support Community (CSC) of Greater Ann Arbor. The Ann Arbor location is the sister location to the original Bride’s Project based in Canada. Donating your gown to The Bride’s Project in the U.S. or Canada is a wonderful way to honor the memory of a loved one who has fought cancer. This New York City boutique is a true find for brides who are looking to donate or shop for a wedding gown. In addition to the wide range of designer gowns in all sizes, the shop also has a wide selection of accessories such as headpieces, veils and jewelry. The proceeds of all sales go to the education of disadvantaged children in New York. The Bridal Garden is a favorite among top designers too, many donate their wedding and ready-to-wear items to them directly. Your mom or maid-of-honor may be able to find an evening gown for your wedding at one of their ready-to-wear sale events! Let your gown be enjoyed again and help a great cause at the same time. What’s not to love about that? I want to donate a wedding dress that was preserved but daughter can’t fit into. Do you accept donations and how do I get the dress to you?